Mayflower Medical Tourism was established to serve the needs of medical travellers whom are in search of high quality yet affordable medical procedures and treatments. 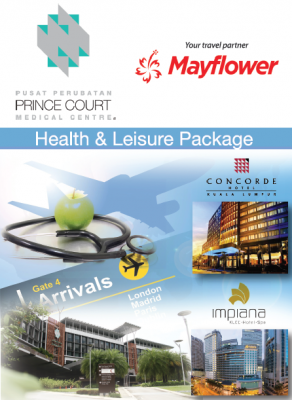 Therefore, Mayflower Medical Tourism is working closely with the elite members of Malaysia Healthcare Travel Council to ensure its medical travellers will receive the best quality healthcare services. By working closely with elite hospitals and medical centres together with their professional doctors and best-trained surgeons, Mayflower Medical Tourism can assist the medical travellers from matching them up with the best in the professions available for their medical needs to provide them with the most flexible and comfortable arrangements during their stay while undergoing treatment or recovery. The commitment is to help the growing number of international consumers to make safer, smarter and more affordable healthcare choices by enabling them to take advantage of the increasing global options in safe and affordable medical care. Try out our health and leisure package that comes with 4 stars luxury hotel which worth every single cents you spent!